This entry was posted on September 11, 2012, 8:38 pm and is filed under Linux, Mac, Programming, Windows. You can follow any responses to this entry through RSS 2.0. You can leave a response, or trackback from your own site. I get a “Script failed” error when I try and run this. Not sure where I can get a log from but if you point me in the right direction I’ll try and help. You missed out the l in there, changed it to hashlib and it worked. Unfortunately the streaming doesn’t seem to work for me, even with the lowest bitrate setting it seems to be buffering the video in its native bitrate, it isn’t usable on a 3G connection. I’m sure this is a fault with jezza’s code and not yours. Will fix in the repo asap and the change should roll out automatically to everyone who’s using it. Regarding the streaming: the default action is to play the video without conversion – to get the low-bitrate version you’d need to open the vid via the context menu (right-click, or ‘c’ key). Be aware that conversion doesn’t work with the latest beta of airvideo (or at least not for me) – haven’t had a chance yet to look into the ‘why’. I was expecting this from a long time. But I have the same problem, “script failed”. There is an update to version 0.8.1 but with the same problem. But thank you very much for this plugin. Hi Huin, have a look at the xbmc log. It’ll probably tell you where the error is. Sorry, I can’t find the error. I’ve tried with a numeric URL, with my domain name and I have the same mistake. Air video server is working sure, because I can access with my iPhone. May I send you the logs? @Huin: maybe search for “error” in the logs and post up any matching lines. The default value (45631) is probably the value you want. It was not a port mistake, but I added http:// before my ip address. Shame on me! It’s a very nice work, thanks for your job. Couple of problems with this (very promising) plugin!! This happens on any item that has a video file in it. Could it be something with reading media info or filesize? Item #2 is slightly more disconcerting. Whenever I reboot the XBMC server with the plugin installed, it kills my networking. I'm hoping this plugin continues in development, I think it's a great start! It looks like air video isn’t (for whatever reason) receiving a URL for the video files (which xbmc & the plugin need). Maybe the protocol is different when connecting to a remote server? I wouldn’t know enough about it to say (but I understand that others can use remote servers without this issue). Is there any possibility that this would be a firewall filtering the URL? It might explain your network issue also. Does the remote server work with your ios client? And what versions of client/server/os/xbmc etc are you running? I agree with and understand your assessment with the situation. the AirVideo App on my iOS devices work correctly with remote servers. Please keep in mind, I’m not trying to (and I hope I don’t) come across as a complainer, I really believe you’re on to something wonderful here! @Tophicles: The XBMC plugin code doesn’t even run until you open up XBMC, and even then only when you actually click on the plugin. Prior to that the plugins are just files on your computer. To claim that they’re preventing network startup … well, it’s surprising. Would you be running XBMC on a system with very limited resources? Perhaps the plugin files are causing your system to run out of physical storage space, and hence (indirectly) causing network startup to fail? I’m sure there’d be some kind of OS record of failure if that were the case: on a *nix you can check syslog – it’s sure to have some error during startup. (Most *nixes will keep 5% free for root, so syslog logs should be kept even if resources are limited). If you do discover what the problem is, please let me know – would be very curious to find out what could cause this! All good questions! I’m running OpenELEC 1.99.2 on a ZOTAC MAG Mini, so resources should not be an issue. 1.99.2 is Eden, so I should be good on revision there too. I can capture the syslog after a reboot with the plugin installed, where should I send it (assuming you want a peek at it) ? @Tophicles: Would this issue be related? It looks like OpenELEC regularly has network problems with plugins. That’s the link to my DMESG capture, but I think that’s after the reboot once I remove the plugin. If the plugin is installed, I cannot get to the box because I have no network. I can access the machine directly, but I have no command line access, I SSH into the machine. @Tophicles: The difference might be (just guessing tbh) that those plugins don’t cache data (this plugin caches thumbnails locally). If that’s the case, then I’m not surprised that this is a common problem. Will that hardware run a different OS/distro? You’d probably save yourself a bit of heartache if you could switch (and open up the possibility of using Frodo – which is well worth the effort imo). I’d love to start using Frodo, but the issue there is that my entire home media system runs from a centralized XBMC mySQL database. Therefore all clients must be on the same release if I’m to maintain hegemony among them. Once a unit moves to Frodo, the library becomes altered and then I have to move them all up to Frodo. I suspect that’s the case (the thumbnail caching), because the script fails when it tries to access the list of video files (where I’m assuming it attempts to grab thumbs). Is it possible to have it not cache them (or make it toggleable) that way I could test that out. The reason for going with openELEC is the ease of install/maintenance. Install of a new client is literally a 30 second affair – 60 seconds to watching TV on the new client after migrating advancedsettings.xml and skin gui settings. With seven HTPCs to serve, it’s too much of a nightmare to have them all on different releases and monitoring which needs to upgrade where and when. I know, I’ve tried that route before and I’m convinced I should have purchased stock in Tylenol ;). Again, the offer stands if you’d like a remote AirVideo server to test against – you know best what your code requires/demands. Thanks for the prompt and earnest replies, it’s nice to know one’s concerns are being considered! (be careful of the capitalisation, and always use spaces to indent, not tabs). That should fix the problem if this is the issue. Regarding the central db: I feel your pain. I was (still am in fact) in the same position here – 5 copies of XBMC all sharing a db, and all needing to be updated together. You’ll find the switch to Frodo wonderful however whenever you can do it – the mysql code is considerably improved. hth anyway, and let me know how it goes. Well, I added “return None” on line 89. Your best approach might be to open this as an OpenELEC issue (or add to the ticket linked above). Just an update, I have tried the AirVideo plugin on both Windows and OSX machines and get the same “script failed” message when browsing into a remote server’s folder. Again, this only occurs when there is the potential for thumbnails or media info to be read, top level folders work fine. I am able to stream from the same server on my iOS device though. Any suggestions? @Tophicles: Your openelec issue with network failure is an openelec issue. And without a full debug log I have no hope of diagnosing your other issue. At this point you have used up your “good will” debugging (getting useful information from you has been like pulling teeth). I would suggest that the issue is specific to your air video server (or the files therein) – and suggest that you start your debugging there. @Waj: Could you enable debug logging and post the log from when the error occurs? There are a few debug lines from just before where the issue is happening which will tell me a lot more. And could you have a look at the log on the airvideo server also? The ‘NoneType’ in the error is a missing part of the response – it could be that the server is showing up some useful error info. Hi, first of all thank you for working on this plugin. Lately I tried to get various video streaming servers with transcoding to work on my Arch Linux box with the intent to stream to a jailbroken iPad2 with XBMC installed. The only one I could get to work reliably including transcoding was air-video-server with the native (free but limited) iOS client. XBMC discovers the server and I can select a file, but it is not transcoded as with the native client. Do you have any tip where I can look to adjust this? @signorRossi: transcoding (i.e. opening the video via the context menu) doesn’t work for me either. I still haven’t had a chance to look into the “why” (I actually don’t use this plugin myself), but I’m guessing that it’s probably a protocol issue. If your coding skills are up to it (and it sounds like they might be?) the easiest way to debug this would probably be running pyAirVideo directly (assuming the problem lies therein). If you do find a solution, please let me know – I’ll patch the plugin with any fixes you find. Ooh, my coding skills are very limited, but I might give it a try. I’ll install XBMC and the plugin on my desktop and see if I can get a tiny idea why it doesn’t transcode, but don’t get your hopes too high. If I understand correctly the issue is with the format used with live conversion, which is not supported. @signorRossi: wow! Good detective work! I think there might be a light at the end of the tunnel: According to wikipedia, XMBC supports this format in “12.0 Alpha 5 and later” (that’s the current beta channel I believe) – so it could be that this is possible without handing off playback to something else. So I guess there’s more to it than that (maybe the XBMC support for this format is only partial, or it doesn’t understand the m3u8 file). hi, i managed to get this script to work. I applied the thumbnail change as mentioned in an earlier post. And then I got the same error as the last post. I just commented out line 76 and removed the # from line 77 (in default.py). It means that the thumbnails are not processed, but you can play over LAN and WAN. Hi, Just stumbled across this today while checking out XBMC on the iPhone. Having a problem with the plugin when trying to open any folder that has videos in it when connected to the AirVideo server. I am able to navigate the folder structure, but cannot open any folder that contains videos. I’ve turned on debugging and generated a log of just the error. 22:46:17 T:224137216 INFO: initializing python engine. 22:46:20 T:224137216 INFO: initializing python engine. This isn’t really intended to be run on iOS. InMethod make a far superior app just for this purpose. Any progress or new development on the transcoding problem? It would be great to get that working as that is the only point for using the plugin , that I can see. I have a few low power xbmc machines that just can handle my high bitrate rips. I’m playing with using plex right now but it seems to crash a lot. 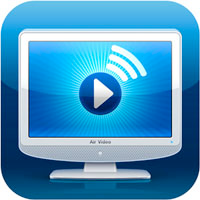 AirVideo server is so much simpler and has servered me will playing to my iPad2 and iPhone. Hope you can get the plugin working for transcoding. @Bricky – Thanks for the reply. I know about the AirVideo iOS app, was hoping to be able to use just a single app for all my viewing pleasure, and the scrapers and interface of XBMC is so much better. @Ray: agree regarding the scrapers, but I actually find the UI for xbmc very poor on the iphone. Maybe that’s just me though. But anyway, the issue here isn’t the quality of the app – InMethod’s only revenue from Air Video is from their iOS apps, and I have no wish to take that away (by writing/fixing something that could be used as a replacement). So, for now at least, I won’t be working on any iOS-related changes (unless they are specifically to break it). @Bricky – No probs with the not wanting to rain on their parade! Have been using the AirVideo app for a few years now. I get an error when i go to a folder where are Videos in it. Is in this Folder only other Folder i get no Error. 21:28:35 T:2876 DEBUG: Previous line repeats 1 times. 21:28:35 T:7876 INFO: initializing python engine.